What's The Science Behind Dog Laughter? Can your Dog Laugh? We like the idea that our dogs smile. Chihuahuas often look as if they have a goofy grin because their mouth is wide and their lips often dark. In fact they often look like they are smiling with their natural resting expression. I am convinced that dogs smile because they are happy. I have seen my two strike up a game and smile in delight. But some people think this is hooey. Most people associate a wagging tail with a happy dog, and it is true that a wagging tail can indicate your dog is enjoying himself. But a wagging tail can indicate a range of emotions depending on context and tail position. Read guide to tail wagging. A wagging tail can also indicate stress and be a warning that you are just about to get snapped at or bitten. We have had numerous comments asking whey their chihuahua wags his tail then bites when a person bends down to pet them. In this instance, the wag was most definitely a ‘stay away’ warning. So, do dogs smile in the way that humans would understand, do they assume a facial expression that indicates they are happy or amused? Modern Dog suggests, that yes, they do. In fact, they go on to say not only does your chi smile but they can also laugh in their own way as well. When a dog is relaxed they will often have their mouth open and their tongues lolling over their teeth. This is the opposite of the anxious dog who will have his mouth clamped shut. But it is very important to get this right or you could approach a dog thinking he is open to an interaction when in fact the opposite is true. Smiling and grimacing are not the same. Thankfully with a chihuahua the ‘curled lip of doom’ will be a good indication that ‘we are not amused’ and your fingers are in danger. 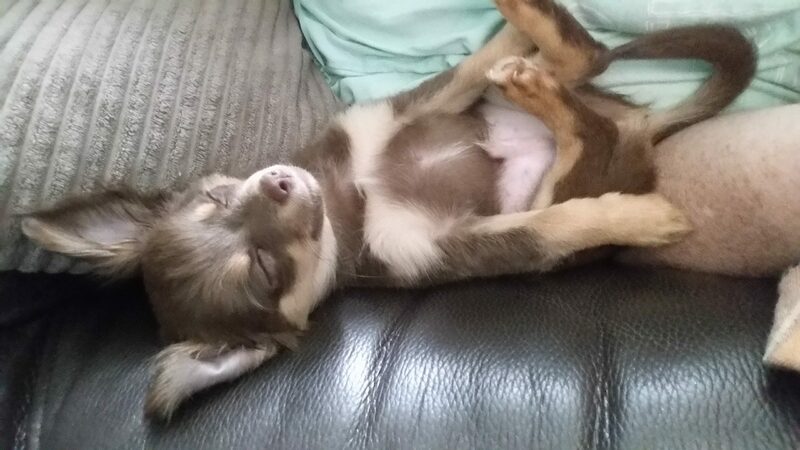 This little fella is having a happy dream! The idea that your dog not only smiles but can laugh as well is very interesting. Dog behaviourists have suggested that their kind of laughing is like a breathy panting. It could be mistaken for heavy panting brought on by a lively game. You can try this and see if it gets you a favourable reaction from your chi. Make a ‘hhuh’ sound repeatedly through slightly rounded lips. Don’t voice the sound use your breath to make it. Do this a few times and see what kind of reactions you get. Warning, it is possible to faint if you over do it. I would also do it at home in case someone thinks you’re having a seizure and tries a medical intervention. We would love to know if your chi reacts to the sound, Minnie came up to see what was going on, Mika just looked at me with his usual distain. There will be people who think dogs smiling and laughing is preposterous, but I bet they are people who don’t have dogs as family pets. I have always believed dogs smile but knowing they can laugh as well makes you realise they are more connected to people than we ever thought possible. Makes sense. My friends tell me that I also tend to smile when I’m getting angry, not as a means of pretending not to be, but without thinking about it.